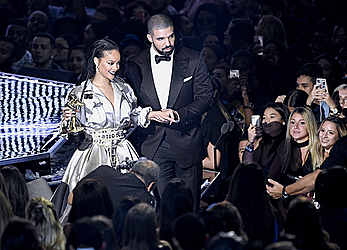 NEW YORK (AP) — Rihanna is thanking Drake for his tribute to her at MTV's Video Music Awards. Drake presented Rihanna with MTV's Video Vanguard Award on Sunday night, saying that he's been in love with her for years and has always looked up to her, even though she's younger than him. Rihanna responded on Instagram on Friday , telling Drake the speech "was so touching and I love you for that." Rihanna performed several times on the show. She calls the night one that she'll never forget and says she's "a lucky girl."